The Miniature Dachshund is long and muscular with short legs. It is just like the Standard Dachshund, only it is smaller and was bred for rabbit hunting rather than flushing out badgers. The Miniature Dachshund is quite a lively little companion dog. 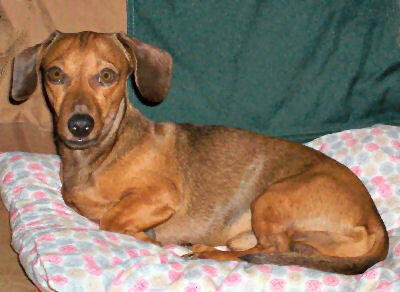 They are very similar to the Standard Dachshund which is the same breed but larger. Miniature Dachshunds are active and entertaining pets, as well as loyal to their owners and protective. They can be quite forward and are often mischievous, but Miniature Dachshunds do make excellent traveling companions. All Dachshunds are prone to back problems, so it is important to be aware of this when choosing one. They may also develop ailements such as heart disease, diabetes, eye problems, epilepsy, or urinary tract problems. Background The Dachshund of today originated in Germany, but this breed has a long history. There are references found in books dating back to the early 1700s. Originally Dachshunds were much larger than they are today. Over time breeders developed them into dogs with shorter legs, so more suitable for digging. This breed first came into the United States in the late 1800's. As well as Miniature Dachshunds, there are Standard Dachshunds and Dachshunds distinguished as long-haired, wired-haired, and short-haired. Some breeders today are also developing Toy or Mini Dachshunds, though they are not yet recognized by kennel clubs . These smaller dogs weigh 8 pounds or under and are less than 12 inches. Description The long and muscular Miniature Dachshund has short legs, a long head and long ears, and dark eyes. The Dachshunds coat may have short, long, or wiry hair. Color variations include solid tan or yellow, bi-colored black, brown, gray, or chestnut, and piebald, speckle-streaked, or harlequin. The term 'Dapple' describes Dachshunds with merle coloration and the term 'Wild Boar' describes Dachshunds that are dull gray intermingled with black in color. Miniature Dachshunds are up to 14 inches tall and weigh around 9 pounds. The Standard Dachshunds are larger, between 14-18 inches tall and around 20 pounds. Care and Feeding Many breeders suggest feeding Miniature Dachshunds puppy food throughout their lives. Their diets should include horse meat, beef, wheat, and yellow corn. The Dachshunds are prone to obesity, so overfeeding should be avoided. The amount and frequency of grooming depends on the dog's coat. Brush Long-haired Dachshunds every day. Wire-haired Dachshunds should be brushed regularly and trimmed twice a year. Short-haired Dachshunds can simply be rubbed down with a damp cloth. You will need to vacuum regularly as this breed will shed moderately. Miniature Dachshunds also have a bit of an odor, so regularly cleaning of the furniture will also be necessary. Housing Your Dog Miniature Dachshunds are usually kept indoors. They do well in a small space and are active both indoors and out. Social Behaviors Miniature Dachshunds get along well with people they are familiar with. Even though they are friendly and outgoing, they are best suited to adults and older children. Dachshunds generally get along fairly well with other pets, but they can get jealous of them. Handling and Training Miniature Dachshunds are difficult to housebreak because they are willful dogs, and they need training that is consistent. Activities Provide them with walks and play sessions every day. This will keep their weight and health optimal. Because of their elongated bodies, MIniature Dachshunds can hurt themselves with too much jumping around, so you should discourage this type of behavior. Breeding/Reproduction Like all Dachshunds, Miniature Dachshunds are prone to the hereditary problems of epilepsy, Cushings disease, thyroid problems, and certain eye conditions. Check the bloodlines of potential mates for these problems. Common Health Problems The back problem, intervertebral disk disease, is quite common. Back problems in general are perhaps the most common health concern for the Miniature Dachshund. They are also easily injured because of their long spines. Take precautions to keep them from getting hurt and discourage too much jumping about.. Availability The Miniature Dachshund is extremely popular, which makes them a favorite of breeders. Consequently they are usually available, but prices vary. Usually they are between $350 and $700. I would wait at least the three weeks if she were mine, maybe even longer just so she has enough some space to adjust to her loss. (There is also a maths question in 2.) This is sort of like a quiz : What kind of small and shorthaired dog is perfect for: 1.A kind but busy man who works on his computer at home most of the time? 2. A nice girl who has a cat and a rabbit and goes to school from 9:00 and stays at school for 6 hours? 3.A funny 16 year old older-brother who plays on his computer most of the time? 4. A caring mum who does the housework all day and cares and cooks for her 2 children and her husband? "Many breeders suggest feeding Miniature Dachshunds puppy food throughout their lives. Their diets should include horse meat, beef, wheat, and yellow corn. The Dachshunds are prone to obesity, so overfeeding should be avoided." NO dog should be fed horse meat or yellow corn! Dachshunds are prone to gaining too much weight. Which is precisely why they should NOT be fed puppy food their entire lives! Corn can cause a bunch of skin problems the first ingredient should be meat. We have had our mini Dachshund for 3 days and I have fallen in love. My husband and I have 5 kids, and we love "Fash". However he is not eating his dog food which is puppy chow-what kind is best for him? He is 8 weeks. I'm not sure what kind of food is best for your puppy, but I've had puppies before and so I've learned that if they don't want to eat their solid food at first. They'll eat it if you add water to it to make it good and soggy. Hope this works for your pup! We kept a bowl of Eukanuba (ground up with blender). I would mix it with warm suplemental puppy milk. Try to add a water, hot water, to make it soft and wait for 5 minutes before you give. Try Beef pro dog food, before my brand is eukanuba but it doesn't like my mini dachs.. so I switched it to Beef pro. Mine is a very pickey eater I tried everything moist hard soft. Now he eats soft and moist but I have to sprinkel his food with NUPRO. It's a dog supplement. He loves it and it makes his coat nice and shinny. You can get it from ebay. It's much cheaper.